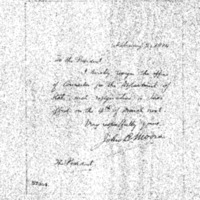 John Bassett Moore sends his official notice of resignation as Counselor for the Department of State. I hereby resign the office of Counselor for the Department of State, such resignation to take effect on the 4th of March next. Moore, John Bassett, 1860-1947, “John Bassett Moore to Woodrow Wilson,” 1914 February 2, WWP18328, First Year Wilson Papers, Woodrow Wilson Presidential Library & Museum, Staunton, Virginia.